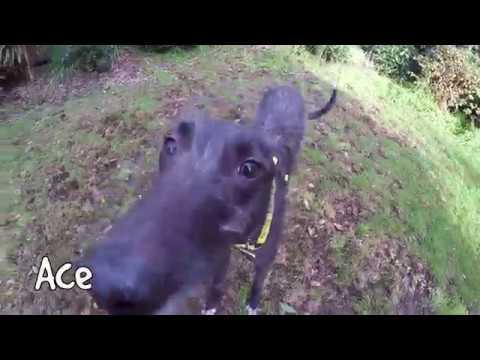 Ace is a young, endearing Lurcher with heaps of energy! This charismatic chap is great fun to be around & will keep you thoroughly entertained with his puppy-like ways. His big loves in life are: playtime with toys or other playful dogs, spending time & receiving affection from his favourite people & filling his belly with lots of tasty goodies! Ace adores other canines and is extremely playful, however, his playstyle isn't always appreciated by others and he is yet to understand this. He could potentially live with another dog who is just as enthusiastic about playing, but would also be just as happy as the only pet. Ace can live with confident teenagers over the age of 14. He cannot live with any cats, small furries, chickens or caged birds. This sweet boy lacks in coordination & body awareness, so is looking for owners who are steady on their feet & a home that is predominantly carpeted throughout. It is essential that he has a garden of his own. Ace has a few training needs, so is hopeful to find supportive owners who could help him continue with this by using positive, reward-based methods. This lovely chap really is one of a kind - a special someone who will embrace his quirks & dedicate lots of their love and time to him would be perfect. He's currently in a temporary Foster Home, so please call our centre in advance of your visit if you wish to know more about him. Thank you for your interest in Ace, who is based at Shoreham. Please note this is not a reservation on this dog. To start the rehoming process you will need to go to a rehoming centre for a quick chat. Please find information below about what to expect during the rehoming process. We hope to see you soon.